The picture above is from around 1915’s -20’s. 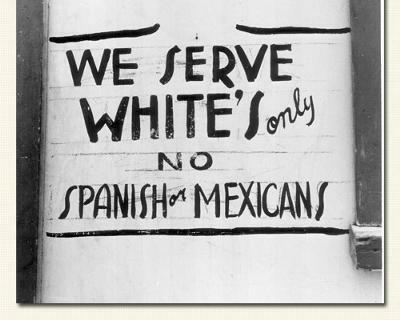 It appears in the book chronicling segregation of Mexican-Americans, “A Place At The Table,” by Maria Fleming (p.97). 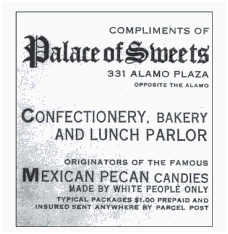 Like all the ingredients of Tex-Mex food, the pecan has a fascinating people history. It is Native to Texas, Mexico and all the way to Kentucky, Indiana, Iowa. Our Native American ancestors ate them happily, sometimes grinding them, sometimes stringing them with thread. The Pecan has been the occasion for people to encounter each other. To reject each other. To celebrate each other. Celebration is the part of cuisine that I really love. Simply put, we enjoy the pleasure of eating, and eating together makes it better. The ultimate “great idea” is for everyone to have a place at the table. Especially when the dessert is that delicious Mexican pecan candy made by Mexicans!